This spring, I finally had time in the right places in my schedule to incorporate teaching into my semester. I'm a Learning Assistant (LA) for 6.042: Mathematics for Computer Science, which offers an introduction to discrete mathematics oriented towards computer science and engineering. The class is taught in a very interactive manner: each hour and a half class session is split into a roughly half hour lecture and a roughly hour long team problem solving session. Additionally, students come from a variety of backgrounds: for many this is their first Course 6 class, whereas some students are Course 6 MEng's; some students have taken many theoretical math classes, while others have only taken one semester of calculus. As an LA, I work on writing the problems for the class, prepare other materials for the class, coach the students during the class problem solving sessions, and hold office hours. Basically, the roles I've been personally assigned as an LA makes me a TA who doesn't have to deal with grading. This semester's 6.042 students took their second miniquiz two Wednesdays ago, and their quiz grades were finalized this last Wednesday. The biweekly miniquizzes in 6.042 aim to test our students' understanding of the material covered in lectures, class problems, online tutor problems, and problem sets from the previous two weeks. Theoretically, students don't need to put in a lot of studying if they've been keeping up with those four areas of the course, but of course, an individual student may need more or less help. The miniquizzes typically average around 15 points out of 20, with a standard deviation of about 4 points. The mean was 12.50 points. The standard deviation was 3.93 points. Hint: One approach is to define a surjective function from to the power set . Proof: Assume that is not uncountable. This means that there is a surjective function . We will show that this is impossible by describing a sequence such that . where is the element of sequence and is a function such that for . By the definition of , for all , proving that is not in the range of . However, . Thus, is not surjective as claimed, and is uncountable. A slightly different wording of my solution was included in the solutions for miniquiz two, below a solution which uses the hint given. The mean was 2.72 points. The median was 3.00 points. The standard deviation was 2.54 points. These "key statistics" really didn't set off that many bells; they just indicate that the problem was hard. However, the way the scores were partitioned alarmed us a lot. 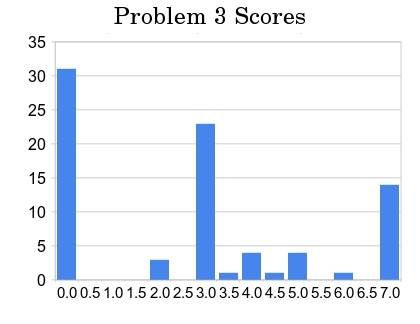 Additionally, students who have consistently done well on problem sets, on the in class problems, and on the first miniquiz did not correlate with students who did well on this problem. How did this happen? Students may have been ill-prepared for crafting a solution to this problem. It is true that they have only seen two proofs similar to this problem: the professor's lecture included a proof which uses an argument similar to the one suggested by the hint, and a problem set problem required a proof structured similarly to my solution. It is reasonable to assume that students are not as familiar with proofs presented during lecture as those they have worked out themselves, but this probably does not fully account for why students performed differently on this problem. Many students who did get at least partial credit on this problem cited that they did not have enough time to think about this problem correctly as they just figured out what they would need to do too close to the end of the quiz. This is probably because the general mindset for 6.042 thus far differs significantly from the mathematical mindset required for proving problem 3's statement, which isn't too surprising given that the mind of a mathematician and the mind of a computer scientist are required to work in (at least partially) different ways. Simply put, problem 3 of the second miniquiz showed me how unnatural theoretical proofs are to computer scientists. I wonder if this illustrates that a deep understanding of math is becoming less and less important for being a good computer scientist as many successful MIT graduates take no math courses beyond the general Institute requirements and 6.042. However, I'd like to believe that even if this is the case, difficult problems incite curiosity within my students, causing them to dive deeper into mathematics. After all, having a better understanding of mathematics can't hurt them as computer scientists. At least, the questions students have personally emailed to me since getting their quizzes back supports my claim.